The Cambridge Super 8 Group is dedicated to the exhibition and creation of Super 8 film as a crucial art form in its own right. As well as the annual festival, the Cambridge Super 8 Group has been active in programming a multitude of screenings, director talks and educational events in the city of Cambridge and in East Anglia. Cambridge Super 8 is also committed to promoting new work and developing critical discussion as well as developing collaboration with other festivals. in San Francisco on Saturday, February 11th, 2012. 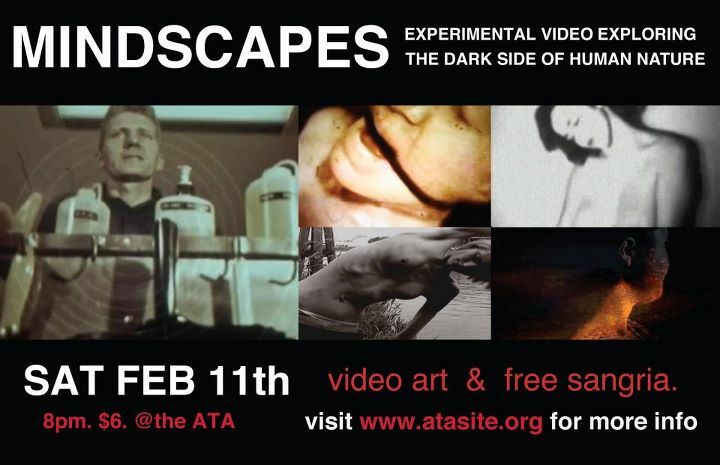 MINDSCAPES IS A FILM ART EVENT THAT STRIVES TO BRING TOGETHER EMERGING AND ESTABLISHED ARTISTS FROM AROUND THE WORLD TO SHARE THEIR ART & PHILOSOPHY IN AN ART HOUSE SETTING. VIDEO ARTISTS GINNETTA CORRELI AND CASSANDRA SECHLER CREATED MINDSCAPES IN ORDER TO BRING TOGETHER ARTISTS IN AN ONLINE COMMUNITY AND TO CREATE A NICHE FOR DARK, PERSONAL FILMS THAT ARE OFTEN IGNORED BY THE COMMERCIAL WORLD. “I feel that these films represent a much larger critical movement that is happening under the skin of society and the mainstream art world. These films demand attention, and we hope to have audience members walking away provoked, saddened, concerned, and perhaps somewhat disturbed by what they have seen at the show.